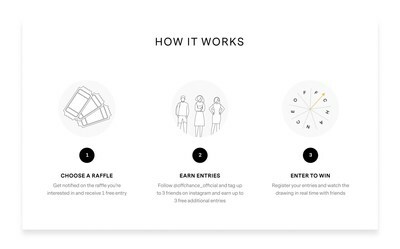 NEW YORK, April 9, 2019 /PRNewswire/ -- Off Chance (www.offchance.com) is a live-raffle platform where entrants can participate and view drawings in real time, providing for a truly transparent online raffle experience. The name "Off Chance" stems from the saying, "in the off chance", which instills the company ethos of honesty and transparency as it relates to contests, drawings, and games of chance. The Off Chance founders recognized the lack of access people have to certain brands and product releases. The team wanted to create a simple and fair way to give access to limited release goods coming to market. On a more philosophical note, they wanted to build a platform to empower and encourage others to give back to their communities. 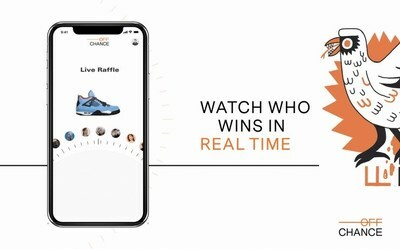 Raffle entrants will be able to watch the drawing and winner announcements live, alongside other participants on desktop or mobile, providing for an exciting and transparent online raffle experience. The proprietary drawing process and experience selects winners who will be sent their prizes at no cost. Off Chance will launch the week of April 8th with a collection of free to enter product giveaways consisting of limited release merchandise from Supreme, Off White, Stone Island, Kaws, Yeezy, Nike, and Adidas. Off Chance was founded in New York City by David Stein, previously, CEO and founder of www.dubsetmedia.com, and Jordan Ovadia, a sneaker collector, dealer and brother of New York-based fashion designers Shimon & Ariel Ovadia www.ovadiaandsons.com. The company will be running raffles for free while opting to build a community with no immediate plans to charge entry to users. Brands can leverage Off Chance's proprietary live drawing experience to market new products and build goodwill with their respective communities by giving back to loyal customers while earning new ones.